Living in the Tampa and doing the job I do you get to work with a lot celebrities and athletes. 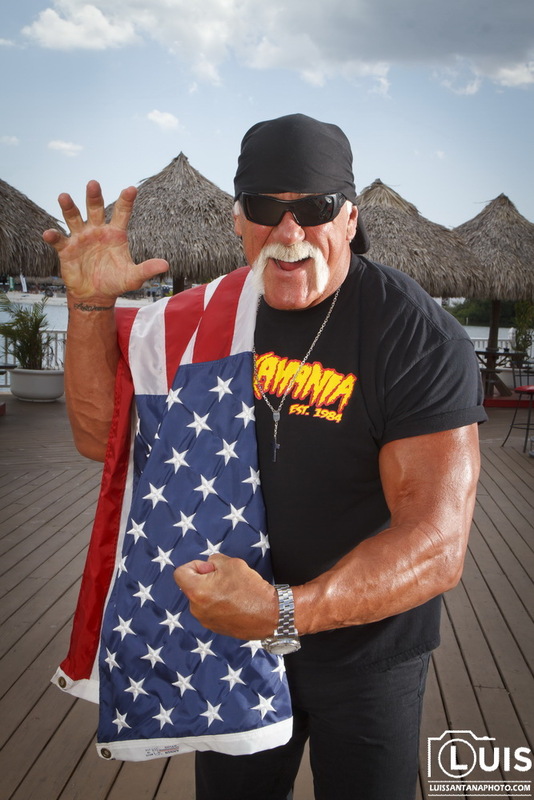 In my opinion none have the nostalgia and personality than the man himself Terry “Hulk Hogan” Bollea. I’ve had the pleasure of photographing him dozens of times over the past 10 years. Some good times, and some during the bad times. I won’t focus on the bad times because thats not what this blog post is about. In my opinion Hulk Hogan has to be one of the top 10 most recognizable faces in sports and entertainment. Last week my editor and I chatted about a concept for our 4th of July cover of the tbt* Newspaper. 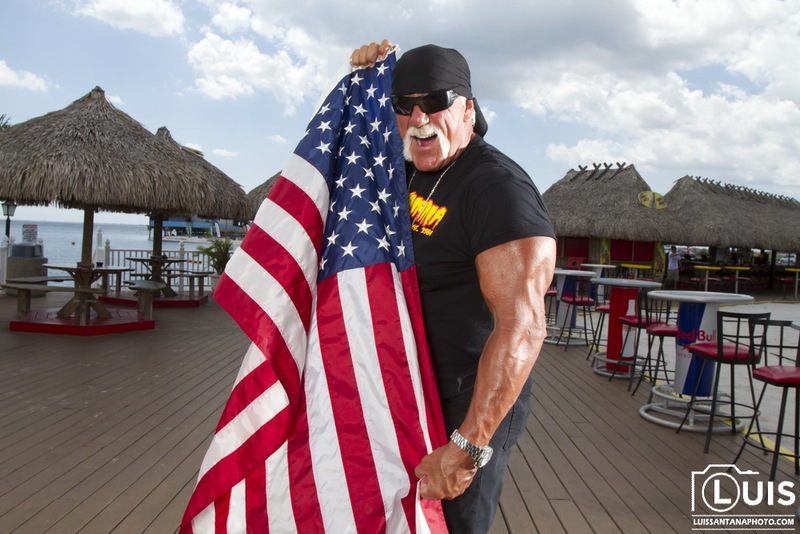 We wanted something big and patriotic, and the one person that came to mind was Hulk. Now we knew that Hulk Hogan is a sports icon who recently signed back in with the WWE. So we were pretty sure he has dozens of requests daily. 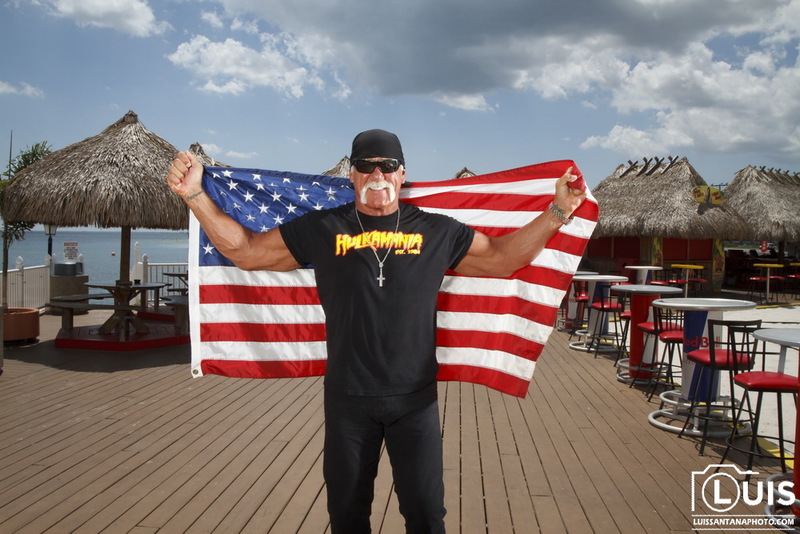 Not to mention the Times did a not so favorable review of his restaurant when they first opened Hogan’s Beach in Tampa. So would he talk with us? Would he agree to a one on one photo? Only one way to find out…. ask. My editor Jay Cridlin made some calls, pulled some strings and BOOM! He Agreed! Now it was my turn to deliver the final product. 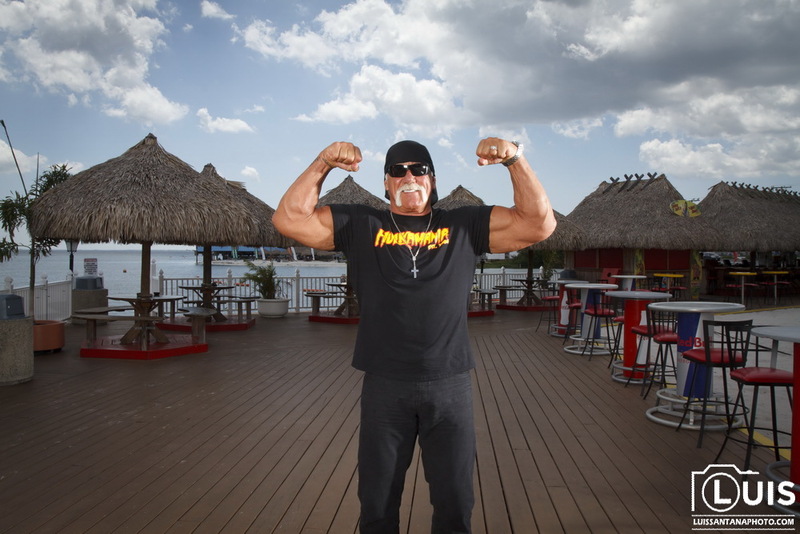 Being Hulk Hogan since the 80’s i’m sure he has done hundreds if not thousands of photo shoots during his long career. So I wanted to make sure we did something a little bit different, patriotic, and that captured his patriotism. I came up with a few ideas, many of which involved fireworks, flags and even a bald eagle. So the next step was to research his previous portraits and see if anything like I was planning had been done before. According to my research so far none of my ideas have been done before. Fireworks and sparklers were out because it would probably not show up in the bright daylight, and the eagle idea wouldn’t work because I no longer had my contact at the Zoo. I was also told that I would only have 15 minutes with him so what I had to do needed to be fast. I opted for the one symbol of this country that shows American pride… The good ol’ Stars and Stripes. The American Flag. When we made our request we told him that it would be patriotic themed and hoped he would wear a red white and blue bandana or something a little patriotic. When Hulk pulled up with his wife Jennifer he was wearing ALL BLACK! So much for that idea, but what was I going to do? Ask him to change? He agreed to meet with us and even agreed to a sit down interview which you can read here so I was just going to deal with what I had. He already agreed to more than we thought so I wasn’t gonna push my luck with a man that size. Speaking of an enormous man and personality. 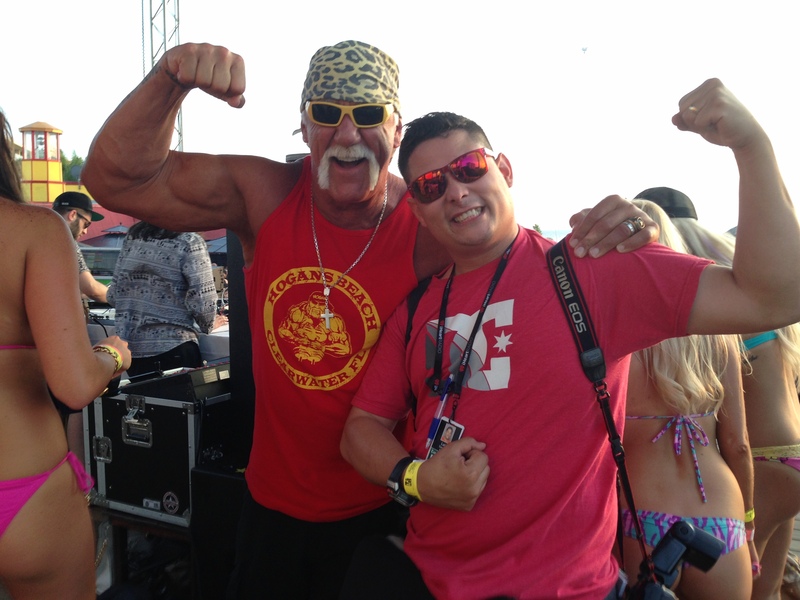 Hulk Hogan is probably one of the nicest celebrities I have ever met. Most celebs you meet are nice when they are in “celeb mode”other times they want nothing to do with anyone (in my experience) But Hulk Hogan must be always “ON” because when asked, every photo and autograph he signs whether it be at his store or restaurant or on the streets. He is always a true professional. So my fears of photographing him one on one wasn’t that he would be mean or rude. It wasa fear that I didn’t want to make a bad photo. I didn’t want to do something that didn’t make Hogan look dumb. So before HH stepped in front of my camera I set up only two lights at probably the worse time to shoot. It was 1:00pm and really HOT, my car’s temperature gauge read 97 degrees. It was the only window we had to shoot him so I had to make it work. I setup a softbox as my main light, a long throw reflector to his right and the sun directly overhead inside some clouds. I did the best with the time and equipment I had but was still nervous. I did a few test shots to make sure my ratios were correct and camera settings were where they needed to be. I had him step in front of the camera, do some flexing, hold a flag, then pose, pose, pose, and we were done. By that time the crowd of people that were eating at Hogan’s Beach restaurant had gathered around us cellphones out. As soon as Hulk was done, he thanked me with the typical, “Thanks BROTHER” and shook my hand. He then proceeded to pose for photos with fans and sign autographs as I packed up. Mission Accomplished. Below is the final result and a few other shots that didn’t make the cut. I found myself at Hogan’s Beach this weekend and found some positive feedback from the article and photos. He even agreed to sign the cover and a few prints.